Unlike Hurricane Florence that impacted North and South Carolina a month ago, Michael is expected to move through fairly quickly. This will reduce the chances of flooding as well as limit the time communities are exposed to strong winds. This area is a fall growing region for tomatoes, cucumbers, bell peppers, squash, eggplant and green beans. Tomato growers in particular are likely to be affected because many of them are situated closer to the coast. Moreover, it is the peak of the season in the Florida panhandle. Growers, however, had little to say other than that they are preparing as best as they can. There are plenty of other crops in season in both Florida and Georgia. These include numerous vegetable crops, while the watermelon season has ended for the most part. Vegetable growers in southern Georgia are quite positive. The area has been fairly dry lately and they are hoping to receive some much-needed rainfall, as long as it is not accompanied by strong winds. Much of this optimism is because the system is likely to move through rapidly. Another grower in Georgia noted that the region experienced a hurricane last year around this time and said they will manage it as they did before. 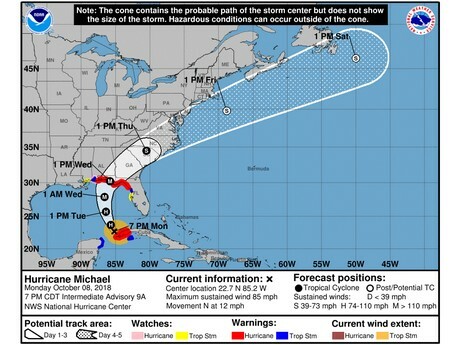 Once it crosses Florida and Georgia, Hurricane Michael is expected to head to North Carolina. However, the system will have considerably weakened and rainfall totals are expected to be in the 2 – 4 inches range.